As we prepare to move out of our old house, we are faced with the huge task of removing the front yard vegetable beds. There are nine wooden boxes, each 4 X 8 feet, filled with nine yards (or more!) of rich soil. Last fall, I cleaned out the remnants of summer: spent squash vines, the last stubs of swiss chard, papery nastursium stems. For months now they have been brown and silent. Although we had very little snow this winter, the beds have been frozen solid. But a few days ago, I went out with my shovel and was able to dig down a few inches before hitting the hard, icy dirt. Time to get to work! I have to confess that I was feeling sad, since I am still unsure where these beautiful vegetable-growing structures will go next (there is no room in the shady new backyard). I was also feeling overwhelmed with the enormity of the task. Moving this soil and figuring out how to get to boxes out is no small job. Thankfully, I had great support. 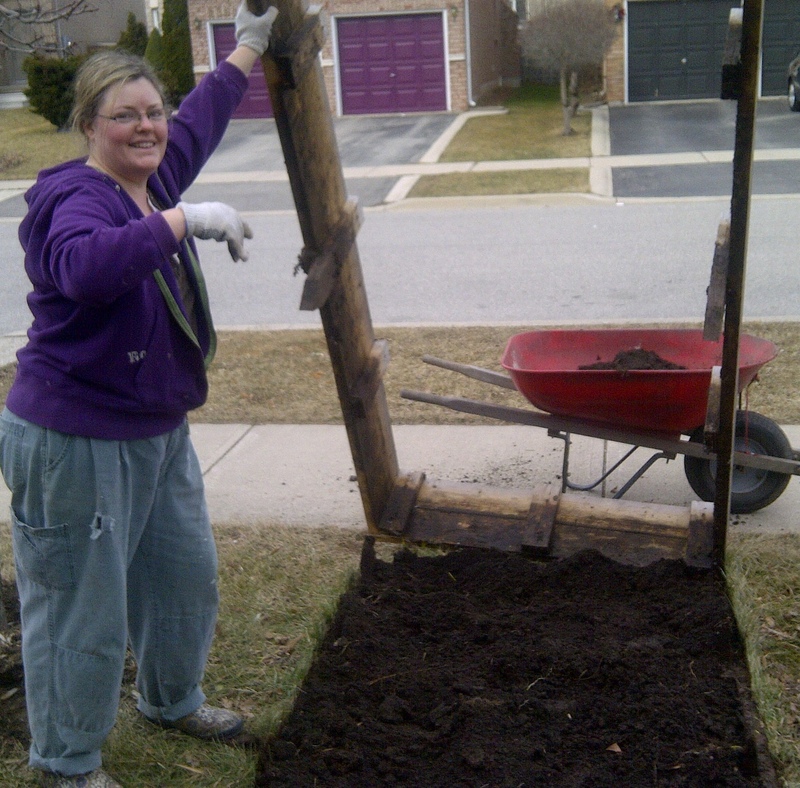 My friend A. came over, ready to dig and we set to work scraping off the top few inches of soil in the afternoon sun. 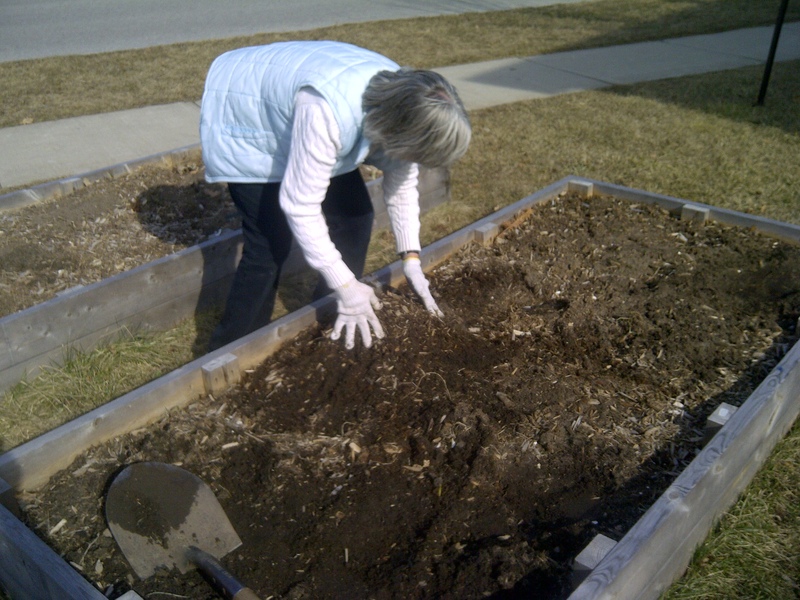 I mostly used my hands (A. used a shovel) scooping earth into the nearby flowerbeds, although the top layer of mulch went to the base of the two trees standing in the front yard. We chatted while we worked and the time flew by. Before long, there was no more to do–all that was left in the boxes was too hard and cold to shovel. I was hoping some rain and warmer days would melt the exposed soil. I didn’t have to wait long for them to thaw. Today when I stuck my shovel into the soil, it sank in with a deep and satisfying ‘swish’. After inflating the tire on the wheelbarrow (in the spring everything needs tuning up!) and calling my eldest child outside, we started shovelling. To be truthful, he did most of the hard work while I removed winter debris from the beds to make them ready for a layer of fresh soil. Anything else would have been a waste of that fine, strapping young man of mine, don’t you think? Surprisingly, there were a few stray tufts of garlic in the box nearest the driveway. I hadn’t given them much thought before, but on closer inspection, the leaves were mostly green. I pushed my shovel underneath them and out popped small, white bulbs! 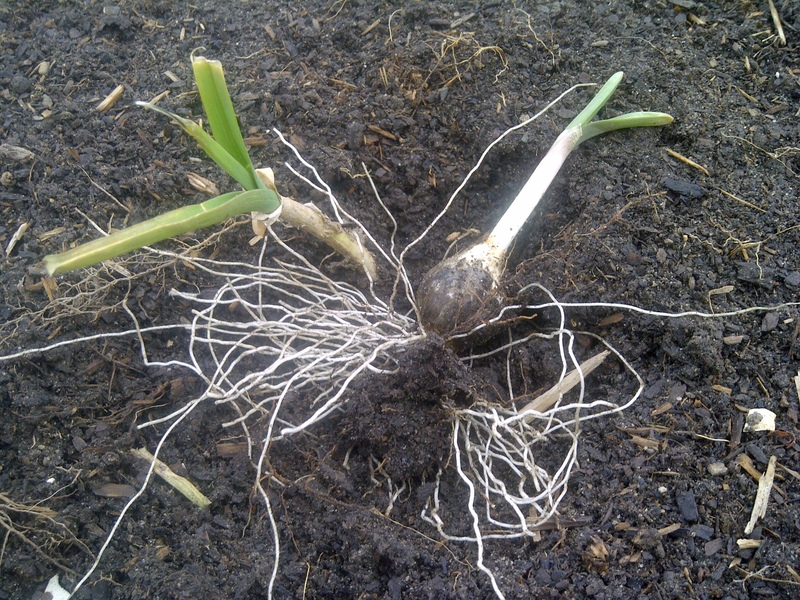 With last summer’s garlic already gone, the timing is perfect. This garlic is fleshy and fragrant–perfect for pan fried shrimp or spagetti sauce! That was not the end of my blessings: when the first box was empty, I took a shovel and tried to pry it up from the ground. Was that the hallelujah chorus I heard? It lifted off without a moment’s hesitation, and even fit right into the van. For now, they are headed over to the church to be stored until we know where they will be installed next. For weeks now, I have been dreading moving my beloved sabbatical boxes. This week, however, I learned that my worry was unfounded. It is going to take some time–we only got two boxes emptied today–but it has been simple and even enjoyable work. With a little help and a few surprises, this doesn’t seem to be such a terrible ordeal after all. I’ve heard that worrying is pointless–it can’t add a single hour to your life. Lesson learned: turns out it doesn’t do much for gardening, either. This entry was posted in Uncategorized and tagged garden, home, life, plants, trouble, vegetable. Bookmark the permalink.